One of our goals for 2009-2010 at Cabrini Connections is to do a better job of quantifying our work. We tell stories on our web site and blogs, but we also want to produce tangible measures of success. Two of the best ways we can do that are with feedback and grades. In Spring 2009, Cabrini Connections asked mentors, teachers, and parents to report strengths and weaknesses observed in his or her mentee, student, or child. Of 59 respondents, 33 are mentors, 20 are teachers, and 6 are parents or guardians. They were asked to measure 21 different fields in three goals areas - confidence, competence, and caring - from 1 (very weak) to 7 (very strong). I have created a 3-page report to summarize the results. Click on an image below to expand it to a pdf. Though we are very proud of the results (every field has a mean of greater than 4), it is important to acknowledge inadequacies. As you look at this data, please consider our methodology and vision, summarized on page 3. As for grades, students receive 25 points for every report card that they bring in; plus 25 for every A, 15 for every B, and 5 for every C. It is one of the many ways a student can earn points in our program (attendance, bringing academic work, completing SVHATS, etc.) and, when he or she graduates, points get converted to dollars (1 point = $0.10) and are used to start an account at Bank of America. In addition to the incentive of points, report cards are also valuable to mentors. Students are encouraged to share report cards with their mentors in an effort to track progress and target challenging subject areas. Former NUPIP Fellow Chris Warren and new volunteer Michael Schubmehl are working on a grades report for 2008-2009. Like survey data, grades are an easy way to track progress and, as years go by, we expect trends to support our Theory of Change. Thanks for your support and please stay tuned as we embark on these important projects. The Tutor/Mentor Connection maintains a Links Library of more than 1500 links to resources for leaders of volunteer-based tutor/mentor programs, youth in tutor/mentor programs, volunteers, business leaders, parents, donors, and media. Subjects areas include homework help, college and career education resources, fund raising tips, evaluation tools, and social entrepreneurship. In total there are 24 main categories. As part of my ongoing orientation at T/MC, I have been consistently exploring these resources. In the first of a three part series, I am going to present five of my favorite links from the first eight main categories. Being a newcomer myself, browsing this library with fresh eyes as many of you are, I hope I serve as an example of how easy it is to explore. Your curiosity is bound to be sparked! I have, on several occasions, followed a chain of links to further discussion of a particular subject. In fact, most of these sites were selected by the T/MC because they have libraries of links that point you to even more extensive networks of information. It's a never-ending cycle! David Hildebrand discusses mobilizing intellectual capital at universities to confront society's most challenging social problems. With higher education must come social responsibility. Universities have an invaluable wealth of resources that can have a direct, positive impact on the world. Encourage your alma mater to support tutoring and mentoring programs in their area (read Chris' blog post using Northwestern University as an example). Create Now helps transform the lives of high-risk and at-risk youth through creative arts mentoring, education, resources, and opportunities. 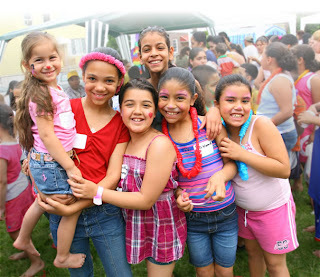 They maintain an extensive database of over 1,200 youth facilities throughout Southern California that enables them to match volunteers with high-risk or at-risk kids in their own neighborhood, based on the youths' ages, genders, challenges and other preferences. Create Now is a unique, very successful example of creative arts mentoring. FORA.tv gathers the web's largest collection of unmediated video drawn from live events, lectures, and debates going on all the time at the world's top universities, think tanks and conferences. This is a great site for idea-sharing and critical thinking! 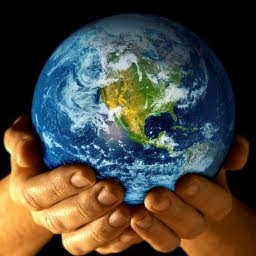 The mission of iEARN-USA is to enable young people worldwide, working in collaboration and dialogue, to make a meaningful contribution to the health and welfare of the planet and its people. Connect with projects, people, and forums in their Collaboration Centre. More than 2 Million students in 125 countries engage with iEARN projects daily. LearnHub is a network of educational communities, each one built around a specific subject (ex. Algebra, History, Software Development). Communities are a mixture of lessons (pages, videos, and presentations), tests, discussions, and fun activities like concept games and general trivia. Students can also apply directly to colleges and universities and prepare for standardized tests. LearnHub is a good example of combining education with the benefits of social networking. 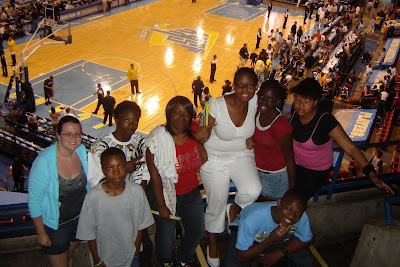 Last night, I, along with new volunteer Joanna Michelson, accompanied seven of our students to a Chicago Sky WNBA game. The Sky played Western Conference-leading Phoenix Mercury. The game was close throughout, with many dramatic drives to the hoop and deep 3-pointers, but the Mercury pulled away in the last minute for a 106-99 victory. A special thanks to Mike at the Chicago Sky for offering free tickets to Cabrini Connections. We were able to reward students who have been using our center over the summer. Savon meets with his mentor every Wednesday, Melissa joined the new Video and Filmmakers Club, and Ana, Malina, and Crystal frequently stop by to make use of our technology center. Though our regular tutoring scheduling runs during the academic year, our center is open all summer and we encourage students and volunteers to make use of it. At least 4x as many students have come this summer compared to last, but there's always room for more! We were also about to reward new students in the program such as brothers Shaquille and Cantrell. Within a week of signing up, they met their mentors and joined the Video and Filmmakers Club. We are happy to see them immediately interact with Cabrini Connections and all it has to offer. We look forward to their success! Lastly, I would like to commend the Sky for their work in the community. Last night they honored Women of Inspiration at halftime, and The Sky Cares Foundation supports the Sky's mission of building girls' self-esteem and providing girls and young women with positive mentors. Tutor/Mentor Connection could be a great resource for fulfilling that mission, so we will be in touch with them. Go Sky! On December 17, 1999, The United Nations General Assembly endorsed a recommendation that August 12 be declared International Youth Day. The Assembly recommended that public information activities be organized to support the Day as a way to promote better awareness of the World Programme of Action for Youth, a policy framework and practical guidelines for national action and international support to improve the situation of young people around the world. "As we look for ways to keep our country prosperous, we need to make the next generation a significant priority. Even economic experts agree that child development is the foundation for community development - which, in turn, is the foundation for economic development. Capable children become the foundation for a prosperous and sustainable society." That quote from the W.K. Kellogg Foundation sums up how I have always felt about children and education. Children are our future! Call it cliche but also call it true. An investment in children is an investment in the future of the world. At Cabrini Connections, our vision is that every child who joins a tutor/mentor program in 7th or 8th grade is starting a job and career of his or her choice by age 25. We achieve this by following seven success steps, from building regular participation in weekly tutor/mentor activities to maintaining connections after high school graduation. 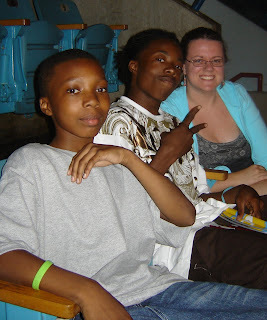 Because of their long-term participation with Cabrini Connections, the continued involvement of our volunteers, and their use of the Internet to share information and network with each other, our youths have a support system that they can draw from as they move through the rest of their lives. I hope that you will take this day to reflect on the potential of youth, to celebrate their achievements, and plan for ways to better engage yourself and your network of family, friends, and co-workers. If you want to help make our vision a reality, please explore tutor/mentor resources on the Tutor/Mentor Connection web site and consider making a donation. Special thanks to Bloggers Unite for asking bloggers to write about this subject. Cabrini Connections' new Video and Filmmakers Club held its first meeting last night with great attendance. 10 kids showed up for lessons in the basics of storytelling. Club Leader Michael Alexander, President of Conscious Planet Media, asked questions like "what is a story?" and "what makes a good storyteller?" Kids shared their favorite movies, television shows, and music videos and used them as examples of storytelling. "Tell me what that movie is about in 60 seconds," requested Michael. The last question of the night was: "what story do we want to tell together?" This accelerated summer session will meet for six weeks. By its end we will have a 3-minute video completed. Right now it looks like we will make a documentary about the Video and Filmmakers Club (who we are, what we do) with a twist: it will be assigned a genre, such as horror or comedy. Thus it will serve a dual purpose. First, it will be promotional and used as a recruitment tool for the fall session; and, second, it will give our kids a chance to explore genre conventions. What are the characteristics, both in writing and on screen, of a horror film or a comedy? The Video and Filmmakers Club is off to a promising start. 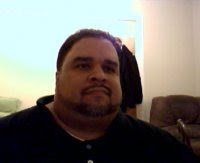 As we continue to meet, I hope that you will follow our blog at http://cabrinifilms.blogspot.com/. The Art Club meets on Monday night, too, and they started a new project last night with several volunteers from Chicago Cares. They are already working toward next spring's Art and Video Festival, so get ready to be amazed! We are very proud of our clubs here at Cabrini Connections, but they can't go on without the continued support of donors and volunteers. If you would like to make a donation to either club, or to our organization as a whole, please visit our web site. Thank you! "Be a mentor," said Daniel. "Be a mentor," he repeated at a whisper. Those are the parting words of Daniel Ramos, a gentleman I met while on an Alternative Student Break in the Sunset Park neighborhood of Brooklyn, New York, in March of this year. He is program director at Children of the City, a community organization serving underprivileged families in the inner-city communities of Southwest Brooklyn. Their services include trauma intervention, counseling, an after-school and summer program, courtroom and legal advocacy, social work, guardianship, financial counseling, youth mentoring, and other as-needed services. As volunteers for a week, 13 of my classmates and I were asked to help with home visits. Children of the City volunteers visit close to one thousand children every single month! They are one of the only community organizations in New York to regularly schedule in-home visits. In the same way that Children of the City expects youth to visit their center, youth can expect Children of the City to visit their center; their home. I could go on and on with my impressions of Children of the City and its staff. Their dedication to the people of Sunset Park is remarkable. Daniel is a particularly thoughtful man to whom I am eternally grateful for sharing his time and insights. That is why I find his last words to be so important. Of all the wisdom he shared over many hours, he chose to end with, "be a mentor." Now, I wish to make the same declaration to you. Be a mentor. When you are a mentor, you show a student you care. You show this by attendance, by your interest in what they do, what they are doing in school, who they are and what is important to them. You are a guide. Your purpose is not to shape a youth to your values, but to help them be everything they have the potential to be. If you're in Chicago, use our Program Locator to find a program that fits your demands for time and location. You're bound to find something! 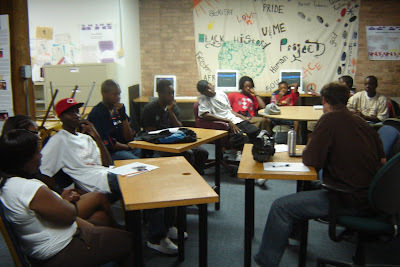 There are more than 200 tutor/mentor programs in the Chicago area! If you aren't in Chicago, reach out to your network, browse our links to volunteer referral web sites, or do a simple Google search. Your time is valuable. Two hours a week can make a difference. In the same time that it takes to watch a movie, you can mentor a child. Please consider it. A heated debate is going on in Chicago right now about whether to allow a second Wal-Mart store to be built within city limits. The proposed super-center would be located at 83rd and Stewart in the Chatham neighborhood on the south side. Supporters of its construction are chiefly concerned with jobs, 500 of which the new store would provide. They also advocate for fresh food given that Wal-Mart would offer groceries in an area relatively deplete of such sustenance. Opponents of Wal-Mart are critical of its refusal to allow union protection. Lack of such protection makes those 500 new jobs somewhat less attractive. Their existence could also threaten the integrity of thousands of unionized jobs in the city. National criticism regarding low wages, poor working conditions, and inadequate health care is also cited in opposition. June 30: A city rules committee deferred a vote on an amendment to the Chatham Market shopping center development agreement that would repeal a clause aimed at keeping out Wal-Mart. 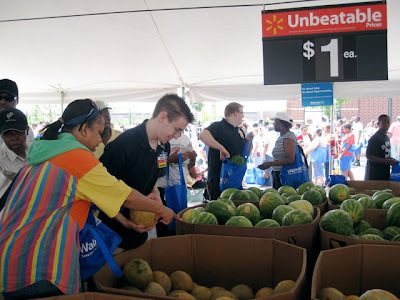 July 25: Wal-Mart holds a farmers market at the vacant site where it wants to build its second Chicago store. July 28: According to a poll financed by Wal-Mart, nearly 75% of Chicago residents support their plan to open a store in Chatham. July 29: About 250 people came out for a rally in the Thompson Center Plaza in support of the new Wal-Mart. July 29: City Council transfers the issue from the Rules Committee to the Finance Commitee, all but delaying a vote until after the International Olympic Committee decides on Chicago's bid to host the 2016 Summer Olympics. My interest in this debate was sparked by reading an excellent blog post titled, "Walmart: maybe it's better than nothing?" In it, Megan Cottrell admits, "Yes, Walmart has union problems, environmental problems, wage problems, health care problems. But they are also the only company willing to come into a tough community, bringing jobs and fresh food with them." It is a tough but simple realization. 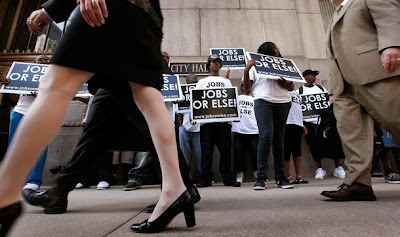 In a neighborhood where the unemployment rate is 20% (Chicago's is 11.3%), people simply need jobs. "We can't wait for the Olympics," said Alderman Howard Brookins at the July 29 City Council meeting. "People are dying now. People are starving now. People are in stores now. There is no convenient time. There's never gonna be a perfect time. If we cannot stand up for the people in the worst economic downturn since the Depression, when can we stand up for people?" Ald. Howard Brookins makes a convincing argument, as does Chicago-based hip hop artist Rhymefest. In an interview with Chicago Public Radio, he provides a good summary of the debate and an explanation for why he supports a Wal-Mart in Chatham. Rhymefest speaks on behalf of Jobs or Else, a group responsible for pro-Wal-Mart demonstrations around Chicago. Cottrell also mentions Food Deserts in her blog post, a concept that I was first introduced to last fall. Mari Gallagher Research & Consulting Group defines Food Deserts as large geographic areas with no or distant mainstream grocery stores. Mari came to speak for Northwestern Community Development Corps in November of 2008 as part of their Undergraduate Lecture Series on Race, Poverty, & Inequality. Her firm's 2006 study, Examining the Impact of Food Deserts on Public Health in Chicago, identified over 600,000 Chicagoans who live in a Food Desert. In June her firm released the Chicago Food Desert Progress Report which concludes that between 2006 and 2009 the size of the Chicago food desert was reduced by 1.4 square miles. "The report provides very interesting examples of the block-by-block impact of stores moving in and out of the city," says Peter Tatian of the Urban Institute. "In Chatham, a food oasis, 2 grocers moved out, resulting in worse food access scores for 142 nearby blocks and roughly 16,000 people and an expansion of the food desert into Chatham." Chatham?! Maybe they do need a Wal-Mart after all. Looking at the progress report, I notice a handful of maps that show Chicago's food deserts. And, of course, when I see maps, I think Mapping For Justice. At Tutor/Mentor Connection, Mike Trakan creates maps that look at the relationship among poverty, community resources, school performance, and locations of non-school tutoring/mentoring facilities for K-12 students. I went to our program locator to look up assets in 60620, the zip code of the proposed Wal-Mart site. 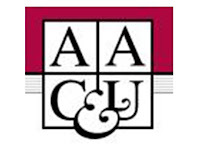 There are seven tutor/mentor programs in the area. It would be great if we could map food sources among the current options. Mike says we should be getting some data soon. I wrote Mari about a possible collaboration, too. As you can see, this story represents a convergence of a lot of ideas. From jobs, to Olympics, to hip hop, to food deserts, to maps, to tutor/mentor programs... my mind keeps firing. I've done my best to summarize the experience, but I do apologize if my run through has seemed scattered. Nevertheless, I hope it gives you the opportunity to learn more about this debate and think critically about its possible outcomes. For more information, check out Walmart’s Chicago Community Action Network and Our Community. Our Choice.